"Patti" asked if I had anything for Johnny Appleseed's Birthday (September 26th). I was glad to hear from her as I wasn't even aware of this special day! I've put together this craft and a few of colouring pages. Glue on the feet, using the tabs to make a 3D effect. 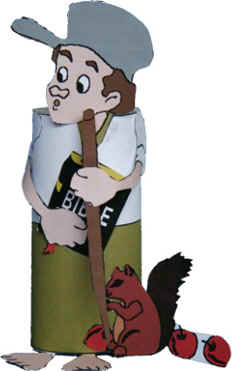 Glue the Bible into one hand and the walking stick into the other.